Amatrol is pleased to announce its participation in LIFT’s Operation Next, which equips future veterans for civilian careers by providing skills and credentials for the most in-demand jobs in advanced manufacturing. Operation Next is made possible by a partnership between LIFT (Lightweight Innovations for Tomorrow), NIMS (National Institute for Metalworking Skills), Amatrol, and the Gene Haas Foundation. 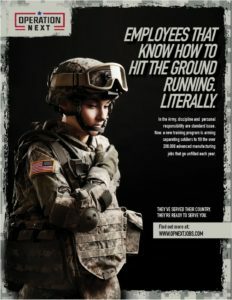 The program provides high level technical training to separating soldiers while they are on active duty via a hybrid training program that combines self-directed, online virtual learning and hands-on skill-building. The acquired skills and knowledge will allow these separating soldiers to fill vital positions in the labor market, specifically focusing on Precision Machining and Industrial Technology Maintenance. Operation Next’s pilot program will launch at Fort Campbell in Clarksville, Tennessee with 101 soldiers. These soldiers will gain national industry credentials, as well as experience local plant tours, job-shadow opportunities, and mentorships.